I think there have, unfortunately, always been a class-element to the baseball teams as they are rooted for in multiple-team areas. Areas like Baltimore, or Cleveland, don’t seem to suffer from the class-dichotomy. If there were an AmericanLeague NY area team that had a more blue-collar, working class element to it, it might have more of my loyalties. I’m thinking about getting out to see some Brooklyn Cyclones games this summer some time. Any interest in that? I’ve been to a few Cyclones games — they’re more about Party Marty and the between-innings spectacles than quality baseball. But it’s fun to catch a game down by the seashore. I know they have games commemorating Irish American, Jewish Americans, etc.— is there a cartoonists promotion on the schedule? 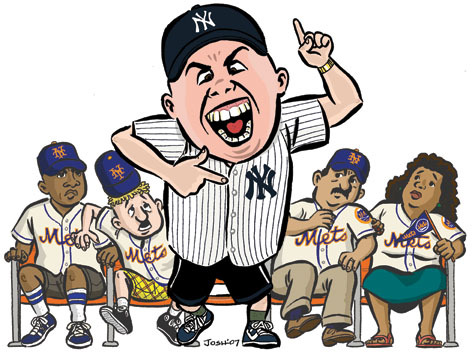 true brooklynites will always hate the yankees, even if the mets cease to exist. most of the old ny giants fans went the way of the yankees. beyond that…yeah, it’s class war.